Zuzu's Wishing Cake by Linda Michelin - This book gives examples of how your child can reach out to other children and show love to all children, even those of a different nationality. Veggie Tales - Are You My Neighbor? The Berenstain Bears Lend a Helping Hand - This Berenstain Bear books may need to be broken into smaller sections as they are longer and geared toward older children. • Matthew 7:12 - Do to others what you would have them do to you. • Ephesians 4:32a - Be kind...to one another. - Make a picture collage of things that you can do for people to show love (kleenex, flowers, cookies, etc.). Add the title "I Can Show Love Too." Decorate a bandaid: Remember that we are to help people. For this lesson focus on the fact that Jesus loves others so we are to show love to others. Discuss ways that we can show love. Make cookies or bread to give to a friend to show them love. Pick flowers to give away. 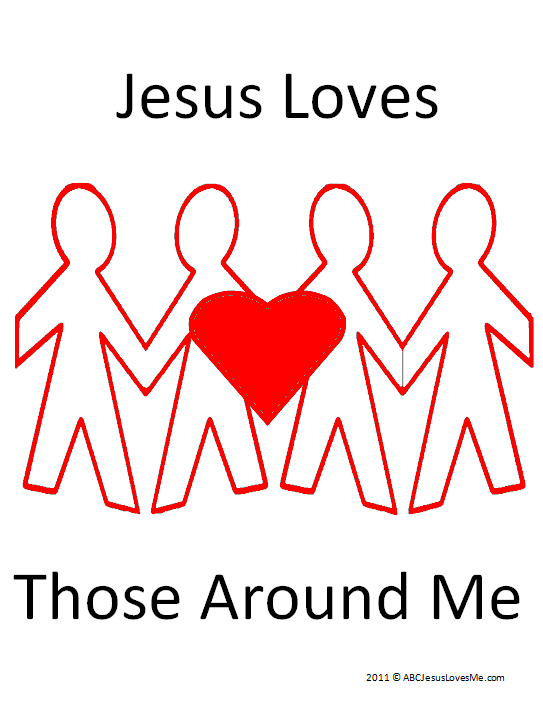 - Print the " Jesus Loves Those Around Me " title page and add the child's name to the line. Sponge paint with a heart. Add and staple or bind all of the pages together to form a book. Review the Bible stories as you look through the finished book. Tootsie Roll - To help all the pain, "roll" off your back. Snicker's Bar - To remind you that laughter is the best medicine. Lifesavers - To "save" you from feeling bored. Dum-Dum Lollipop - To remind you to not do anything that silly again. Chocolate Covered Raisins - For when your spirit needs "Raisin." Flipz - To remind you that you will be back to doing "flips" in no time. Mounds Bar - To remind you of how much you are loved. Bubbles - To just blow all your worries away. Hershey Kisses - Because they always make you feel better. 1. Give each child a copy of the list above that you have already printed, a zip-lock bag, and one of each item in the list. 2. Let the child put their items and the list in the zip-lock bag and seal it. 3. Place two hole punches somewhere near the top of the zip-lock bag and have the child string a ribbon through the holes and knot it for a nice decoration.